For some reason in this attempt I had trouble selecting all the lines in the body. When you clicked on the "Select" button did you have the "Group" button selected and the "Ignore backfaces" switched Off and then use a click and drag select? I found that if you didn't do that it was easy to miss bits. Or if you went into the Groups tab and clicked on each group one at a time then clicked on "Select", I found it worked OK.
My animation didn't work correctly first time either so I just opened the project up again and put in 4 keyframes with the prop rotated 90 degress each time, then exported the animation (with a new name just in case) and chose that name as the default in MW. That fixed it. I'm guessing that you have to have more than just two keyframes so the software knows in which direction you want to rotate. Also I wonder if the two end frames should actually be exactly 360 degrees different? Maybe the last one should be slighty short of the full circle, otherwise two frames will have the prop in the same position. When you clicked on the "Select" button did you have the "Group" button selected and the "Ignore backfaces" switched Off and then use a click and drag select? "Select the Face option and turn OFF Ignore Backfaces." I'll try your method next. I'm also wondering if I have a Video Card issue as I'm seeing some quirky stuff in this function. Yes sorry you are right I meant to write "Face" however I have been working on another model and have been using "Group" and that seems to work for me. One other thing I have found tricky is the fact that you have to "weld" all the touching vertices together when you use the method of building one side of a symmetrical model then copying and flipping it. However if you remember to "Hide" the groups you are not actually working on it does get a little easier. I will try and do a new tutorial showing how to bring this weird TVTree in to Moviestorm when I get a few more free minutes. HERE IS ANOTHER AMAZING MILKSHAPE TUTORIAL! This time I give you a quick run through on building a simple object (a cube) from scratch, assigning 6 different materials and getting it in to Moviestorm. PDF and accompanying files attached, the Milkshape file is basically the finished state for reference. Thanks Chris, will try a.s.a.p. Totally awesome, I can't wait to dig into this! Thank you, Chris! You can connect with us On Twitter, On Facebook, On YouTube, and On Vimeo. This looks interesting, is there any way with Milkshape to crate 'Accessory' items..? No idea, you could try creating bones with the same names as parts of the actors, skinning objects to it and seeing if you can make it work. I haven't got the time to do such tests as it could take some time finding the workflow. I finally got round to following your tutorial Chris and got a very good result. What problems are you having kv? I have probably had them too and may have found an answer. Well I imported a .3ds format sketchup model that I made, it`s only a very simple model but when it imported into milkshake even though the textures show in material they do not on the model. 1). You have to assign a material to each group. In the Groups tab does each group have the material name next to it? If so, make sure you have chosen the "Textured" view in whatever window you are using (right click on window for option). If it still doesn't show, the model may have lost the link to the true material location so go to the "Materials" tab and click on the Material name button (next to the top "None" button) then navigate to the material in your folder and it should reappear on the sphere and in the window. 2). Not sure what is happening here but see in the 3D view? I think the light green lines are your "Bones". The Triangle and "circle" are guides for when you want to move them. I normally only see those when I select a joint and click "Move" or "Rotate" and those shapes have the "joint" at their centre. I think the problem you've got with the bones is that your model is really tiny and the bones are really huge. Try scaling the model up a load or changing the scene scale. You need to weld the vertices. Select each mesh and find the "weld" menu item. I think plain weld is better than nearest or whatever its called in the same menu. This got me for a long time also. Milkshape often needs to re-weld vertices. Meshes often need welding upon import. Milkshape often needs to re-weld vertices. Meshes often need welding upon import. Yes it is infuriating at times, even without importing. E.g. 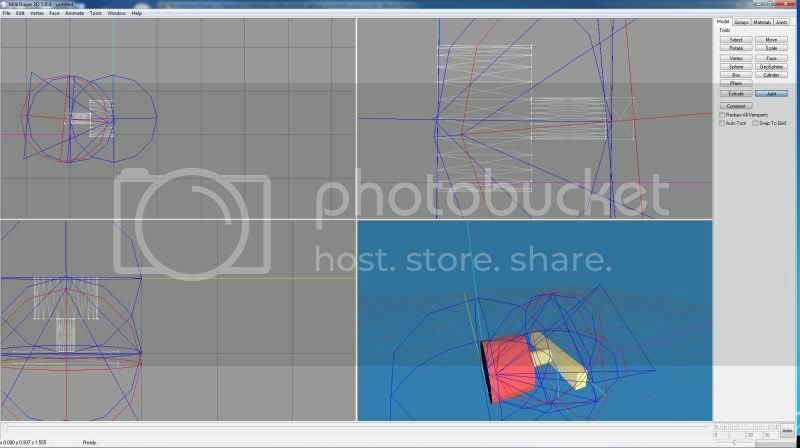 Create a new box, select a corner vertex and open Manual Edit. It will show there are actually 3 vertices, one for each face. Is this normal behaviour for 3d Modelling programs? Wow! Haven't tried it yet, but this is totally cool!